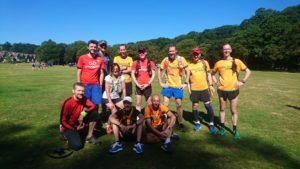 Striders newsfeed advertised a parkrun ultra. What’s this? I thought, how does this work? Information was to meet up at 4am and run all 5 parkrun’s in Sheffield. An added option for those who wanted was to ‘just to dip in and out’ do your own mileage. It sounded interesting and yet mad. Could I do this? I have completed two ultra’s and trained for months before undertaking them. I haven’t done any long runs since the beginning of May, so I had some doubts about staying the course. Always an option to call for a taxi if need be! Up I got at 3am and off I went to the meeting point. It was dark, nerves really set in. Did I really want to walk through a dark park and meet a bunch of guys that I had never met before? I faltered, but alas to late coming towards me was a mass of gold and green! I joined the group and off we went. Graves park completed and onwards towards Castle, the pace was steady and I was beginning to feel a bit more confident. Thoughts were do the first two runs, make a decision and turn back if need be. I didn’t realise that someone would be following us on a pushbike to take photos, Huh my striders vest was still in the laundry from the relays earlier in the week, so not dressed right then! Photos on route included running down the tramlines at Gleadless Town end. Bizarre. Castle completed, we went out of the rear entrance, through Manor park and hit the trail for Attercliffe. Shucks I needed the loo. Thankfully one was available from an all night petrol station! My impromptu stop resulted in the guy’s having to wait for me and re-group, my reappearance was met with a round of applause. No embarrassment there then. Onwards towards Concord I realised I hadn’t been hydrating, the early morning was cool and I hadn’t felt thirsty coupled with initial nerves, toilet needs I just forgot to refuel. At Concord some really kind person had turned up with a car boot full of goodies, time for a short break. Unfortunately I’d already begun to feel nauseous and the thought of food did not really help, maybe I needed to admit defeat and go home. I decided to have an extended break, and while everyone went off and did the first lap of Concord I stayed behind to take in some fluids and a few sweets. Determined to move on I managed to get the second lap in and move on towards Hillsborough, this was a steady section, and I managed to get back into it. Someone else joined the group here, it was nice to see people coming and going and all very sociable. Having got my stride back, the sun was coming out I was ready for something to eat. Out came the marmalade sarnies! Just what I needed. It worked; following Hillsborough was one of the steepest inclines of the day. And I wasn’t the last person up. My AWOL confidence was returning, we were on the last leg and I was surviving. More photos were taken and onwards to the final parkrun of the day. We had made it to Hallam with time to spare. Completing the final parkrun felt great. The interview afterwards (again hadn’t realised this would be taking place, so, not ready for it) the emphasis for this run was really about getting people out more, attending the park runs and generally becoming a healthier nation. It can be fun and sociable. I didn’t manage the full 31 mile, only clocked up 29.2, but not going to beat myself up over this after all there’s always next year…. I’d like to say a big thank-you to the organiser who made the run possible. I would never dream of doing anything like this solo. And thanks to all who made me feel welcome. Cheers to Neil who gave me a lift back to the start point to collect my car. Further reading can be found here, courtesy of David Bocking.